Andrea and I went to the First Friday South End Gallery Crawl yesterday. This, in my opinion, is the best gallery crawl in the city. And with the weather being perfect, it was a great turnout. 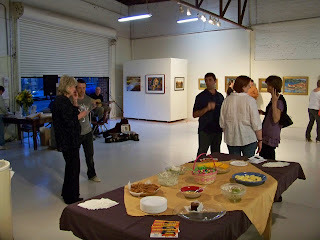 There were 11 galleries participating, many of them serving wine and light refreshments as patrons perused the spaces. Charlotte Art League sort of serves as the home base for the gallery crawl, so it's usually a good idea to start your trek there. Plus, they feature live music. Our last stop was Lark & Key Gallery. 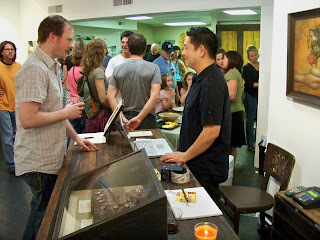 Owner and artist Duy Huynh, who has his artwork on display along with those of other artists, was a hit as I saw several of his pieces purchased. Some of his paintings looked like they could be scenes from a Tim Burton film.